As Hurricane Sandy batters the East Coast, I have been wondering about whether climate change is to blame for the increased hurricane activity in recent years. This year, we have already had 19 named storms (“S” being the 19th letter in the alphabet), 10 of which have become hurricanes. Did you know that there have only been seven hurricane seasons with this much activity since 1851 when hurricane records began? But, four of those seven seasons have occurred in the last 10 years. In each 2010 and 2011, we had 19 named storms, as well; in 2005 (the year Hurricane Katrina hit), we had a record-breaking 28 named storms! These figures would lead many to believe that rising global temperatures are to blame for increased hurricane activity. It’s an intuitive conclusion to make, right? Well, it turns out that conclusion may not be true…or at least we can’t yet prove its veracity. Over the summer, I attended a webinar hosted by a National Oceanic and Atmospheric Administration (NOAA) scientist who reviewed the historical hurricane data for the United States. While this scientist revealed that uncorrected data indicate that we have, indeed, seen a substantial increase in the number of hurricanes and tropical storms over the course of the last 100 years, he also explained why this data could be misleading. As technology has improved, so has our ability to detect cyclonic activity. Today we are easily able to perceive cyclones that never reach land or that die out very quickly because we have satellites that track meteorological activity; but identifying these storms 100 years ago would be very difficult and much less likely. When historical data has been updated to factor in these missed storms from the early twentieth century, it appears as though hurricane activity is not actually trending upward the way we had initially thought. El Niño has not yet formed. El Niño is a pattern of warm surface temperatures over the Pacific Ocean that causes heavy winds to stream eastward and disrupt the swirling pattern of winds over the Atlantic. Because El Niño has not formed, cyclonic winds over the Atlantic can continue unperturbed. The Atlantic Ocean Basin is in a warm phase. Since 1995, the Atlantic Ocean Basin has been in the warm phase of the Atlantic Multidecadal Oscillation, a well-known cyclical climate pattern. The warm phase typically lasts for 25-40 years (so until anytime from 2020 to 2035). Warmer water helps to both form and strengthen hurricane, so the warm phase is often accompanied by a greater number of storms. It is premature to state that human emission of greenhouse gases has impacted hurricane activity in the Atlantic, but human activity may have already caused changes that are not yet detectable or have not yet been modeled. By the end of the twenty-first century, anthropogenic warming is expected to increase average hurricane intensity by 2-11%; these hurricanes are expected to see up to 20% higher rainfalls. Anthropogenic warming is also expected to cause an increase in the number of “very intense” hurricanes in certain areas. Weather patterns are complex. They are influenced by many different factors, both natural and man-made. The truth is: it’s difficult to know the true impact of human activity on all of Nature’s systems. But, it’s safe to say that our activities do have an effect on the environment. 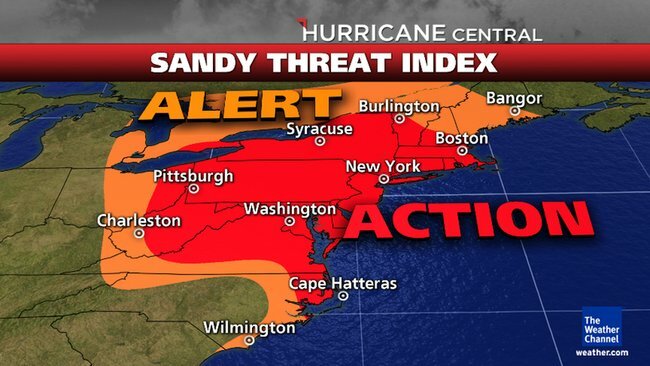 To everyone affected by Hurricane Sandy, stay safe!